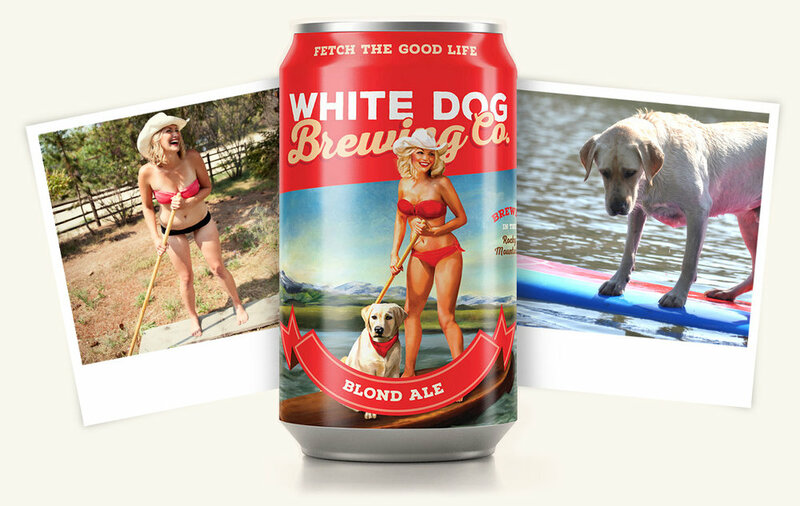 The dynamic duo of Mandy & Ruger were a natural choice to grace White Dog's Blond Ale label, as they both share a passion for fishing and know how to fetch the good life. Ruger has even been known to dive down and catch Salmon in Alaska from time to time. It's worth noting that Ruger practices catch and release; he'll carry the fish around briefly, but always returns them safely to the water. Although Mandy has only recently become a paddleboarding enthusiast, she nailed the pose during her photoshoot, and is now hooked on the sport! Ruger has also spent some time on a board, and you can see from his picture that he is hungry for more! "When I did the shoot for white dog I was holding a broom stick standing on a board in the grass and then Loni worked her magic to make it look amazing!" Moscow Mule or lime margarita on the rocks. What’s the best compliment you’ve ever received on your White Dog label? Funny enough my dad probably is the most proud. Always excited to tell anyone he talks to at a brewery in Portland or wherever he is about White Dog Brewery and my beer and any Montana brewery he has been to. He cant wait to visit White Dog in person for a beer on the frost rail! You're the White Dog paddle board girl! Have you ever had a paddle board or water sports fail? Triumph? I honestly had never paddle boarded until this last year. When I did the shoot for white dog I was holding a broom stick standing on a board in the grass and then Loni worked her magic to make it look amazing! Now I've tried it and love it though and am totally hooked! My biggest water sports fail was probably knee boarding years ago. Could never get up on the board and kept wiping out. Its a good thing slo-mo cameras weren't around then! Best pickup line you ever heard? On the first date with my husband he took me on a motorcycle ride and "happened" to stop under a mistletoe tree. He started pointing different things out in the area, and then at the end told me we were under the mistletoe tree. He swears he didn't do it on purpose, but it was good move if he did. Hiking and anything involving water. We spend most of our summers floating, fishing, and catching crawfish in our creek. First beer you ever drank? My grandpa gave me a sip of his Coors Original when I was a little kid. I spit it out and swore I would never drink beer again! Now I love beer, and a Coors original can always hit the spot. What’s your dog’s favorite snack? He loves pig ears, but his favorite snack is (almost) anything his humans are eating (especially his baby brother currently). He doesn't play with his toys much, but LOVES to steal hats or gloves from anyone around, especially his Dad (because it stinks the most). He sneaks on the nice leather couch at night and sleeps belly up with all four paws straight up in the air. What is the naughtiest thing your dog has ever done? When he was a puppy, he was a bit of a Houdini. He would jump the tall fence somehow when we lived out Springhill by Roy's Barn and one day he followed a combine around all day. If your dog could be another animal, what would it be?